Beautiful car, isn’t it? This car was manufactured in 1965 by the Rolls-Royce Motor Cars Limited, Crewe, Cheshire. The car was fitted with a limousine body by Mulltner Park Ward and finished in Valentines Black. When completed, the Phantom V was then delivered to John Lennon on June 3, 1965 with the license plate number being FJB111C. 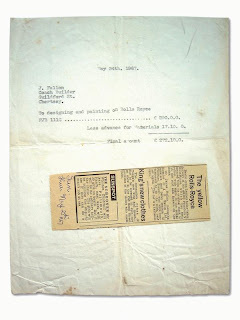 A guarantee was issued to John Lennon on 10 June 1965. The car measured 19 feet long and weighed three tons. On December 21, 1965, John ordered a Sterno Radio Telephone and the number WEYBRIDGE 46676 assigned to it. In 1966, the car had the rear seat modified to convert to a double bed. A custom interior/exterior sound system was installed along with a "loud hailer." Other features that John Lennon had installed at this time were: Sony television; telephone and a portable refrigerator. On January 7, the car went in for a mileage check and the odometer had recorded 6,673 miles and on March 28, that same year, the car clocked in at 11,181 miles. Later, on February 4, in 1967, the odometer would record 29,283 miles clocked on the Rolls-Royce. Interestingly enough, John had his chauffeur and car sent over to Spain in 1966, while he was filming "How I Won the War". It was reported that his Rolls-Royce Phantom V was painted with a matt black overall, which included the radiator and chrome trim. 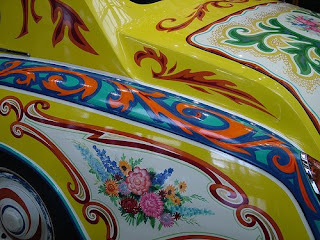 John’s newly painted psychedelic car drew some public outrage when a old woman, in London’s downtown, attacked the car using her umbrella and yelling: "You swine, you swine! How dare you do this to a Rolls-Royce." Obviously, the Rolls-Royce is passionately regarded in England as one of the many symbols of British dignity! The Beatles used the Rolls exclusively in their heyday from 1966 to 1969. In 1970, John Lennon and Yoko Ono had the Phantom V shipped to the United States. 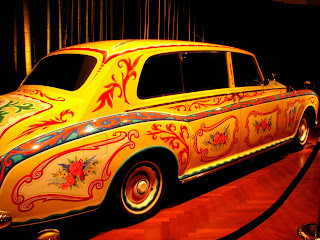 The car was loaned out to several rock stars such as the Rolling Stones, the Moody Blues, and Bob Dylan. When the car was available, the Lennon’s seldom used it and so consideration was given to sell it to an American buyer -- but a deal never materialized. As a result, the car was put into storage in New York City. Then in December, 1977, John and Yoko had serious problems with the United States Internal Revenue. The couple arranged to have a deal worked out where they would donate the car to the Cooper-Hewitt Museum in New York City, a part of the Smithsonian Institute, for a $225,000 tax credit. From October 3, 1978 to January 7, 1979, the car was put on public display at the Cooper-Hewitt Museum and then returned to storage at Silver Hill, Maryland. There, the car would remain in storage and kept from public viewing for a while. The reason for this was because the museum could not afford the insurance coverage for public viewing on a full-time basis. On June 29, 1985, the Cooper-Hewitt Museum decided to auction the car off through Sotheby’s. Before the auction began, The Rolls-Royce Phantom V was estimated by Sotheby's to fetch between $200,000 to $300,000 (U.S.). When the car was sold, it pulled in a surprising $2,299,000 (U.S.) and was purchased by Mr. Jim Pattison’s Ripley International Inc., of South Carolina for exhibition at Ripley’s "Believe It Or Not" museum. The purchase of the Phantom V through Sotheby’s resulted it being listed as the most expensive car in the world and installed with the South Carolina license plates LENNON. In 1987, Mr. Pattison presented the car as a gift to Her Majesty in Right of the Province of British Columbia and displayed in the Transportation Museum of British Columbia at Cloverdale (near Vancouver). Then, in 1993, the car was transferred from the Transportation Museum and sent to the Royal British Columbia Museum in Victoria, British Columbia. Here the car would be kept for secure storage, displayed only for fund-raising and occasional use. The car was serviced and maintained by Bristol Motors of Victoria. "Samples were mounted as cross sections to determine the structure of the paint layers. Paint chips were also analysed using Fourier transform infrared spectroscopy, X-ray diffraction, X-ray microanalysis, and polarized light microscopy. The analysis revealed that both cellulose nitrate and an oil-modified alkyd resin media had been used and that the surface of the paint had been coated with an oil-modified alkyd resin varnish. A colourful array of pigments was identified, including chrome yellow, titanium white, ultramarine blue, and toluidine red. "Based on the materials identified, cleaning and waxing the car was recommended; the analysis showed there was nothing in the paint that would be harmed by water or by the application of a protective wax coating. To minimize damage to the varnish and painted surface, it was also recommended that the car not be exposed to direct sunlight for long periods as this could cause deterioration of both the cellulose nitrate and the alkyd resin." 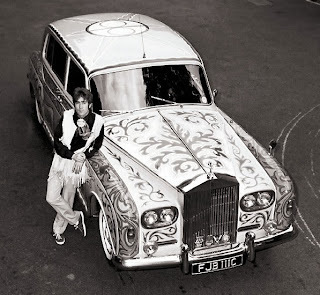 From 9 March 1996 to 15 September 1996, John Lennon’s Rolls-Royce Phantom V was displayed at the National Museum of Science and Technology in Ottawa, with as passenger a sculpture of John by Joanne Sullivan. 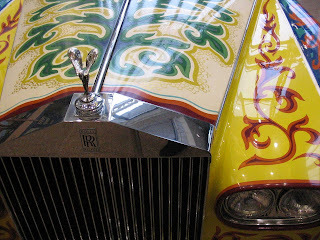 "During the making of Sergeant Pepper John decided to have the Rolls-Royce painted. Colour and design were of the utmost priority and he employed a firm of barge and caravan designers to do it for him. The idea came to him when he bought an old gypsy caravan for the garden." -- Cynthia Lennon, from her book, "A Twist of Lennon", page 142. 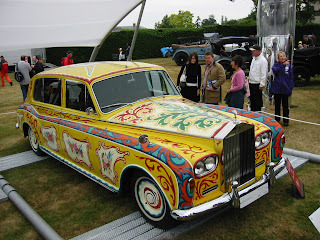 "During the making of Sergeant Pepper John decided to have the Rolls-Royce painted. Colour and design were of the utmost priority and he employed a firm of barge and caravan designers to do it for him. The idea came to him when he bought an old gypsy caravan for the garden." Cynthia Lennon, from her book, "A Twist of Lennon"